Take the hassle out of creating promotional items when you choose Black Bear Customs. We draw on extensive industry expertise to create one-of-a-kind items using our highly efficient screen printing in Grafton, WV can create the custom t shirts and embroidered clothing your team, business or group needs. We'll make sure you get the durable, eye-catching signage, decals and marketing graphics that make you standout. Contact us today for more details on our printing services in Grafton, WV. 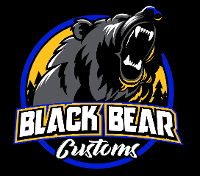 Black Bear Customs is a full-service printing shop serving clients in the Grafton, WV, area. We have years of hands-on experience and we offer value-added high quality printing and embroidery services designed to give you the best possible results every time. At our family-owned shop, we pride ourselves on giving clients a "mom and pop" vibe combined with the high standards and quality of corporate operations. This means that you get the friendliness of a family atmosphere, but the efficiency and cost effectiveness of a much larger shop. With the capability to print up to a thousand shirts an hour, we make printing projects easy. Additionally, our crew is known for their detail-oriented work, and we stand by each and every one of our products. Our focus is to value your time, as efficiency is our mission. We want our clients to trust that they can rely on us to tend to all of their printing needs.